For files in .pdf format. Adobe Reader is required to open and view them. Click here to install Acrobat Reader. This brochure includes information on the C63T Crossbox. This brochure includes information on all cranes and crane accessories. Complete manual for 2000 series cranes. Beginning with serial number 5271 and later. Complete manual for 2500 series cranes. Beginning with serial number 5271 and later. Complete manual for all RKI 3200 ER series cranes. Beginning with serial # 5369 and later. Complete manual for all RKI 3200 ERX series cranes. Beginning with serial number 5369 and later. Complete manual for 4000 series crane. Beginning with serial # 5382 and later. 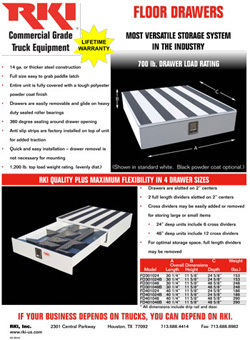 This single page flyer promotes the new RKI floor drawers effective 12/1/09 redesigned 2/24/10. Same heavy duty construction as our Standard Bodies but with even more. This single page flyer promotes our new low profile side boxes. This single page flyer promotes our new low profile wide side boxes. New offset lid C63 crossboxes and gas shock option in lieu of spring compression. This brochure includes information on Space Packs and Saddle Compartments. This brochure includes information on all service body models. These pages include specifications for all standard service bodies. 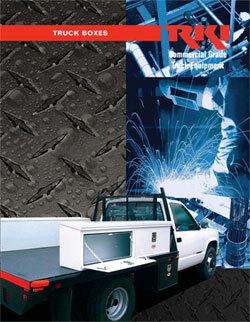 This brochure includes information on all models of boxes, window grilles, rear grilles and trays. These pages include specifications for all standard truck boxes. 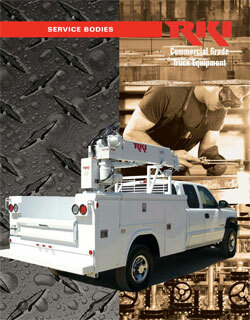 This brochure includes information on all standard winches and speed reducers.